The long term impact of these thoughtless actions caused the complete extinction of the Pinta Island species and others. In the 16th Century, there were more than 250,000 tortoises, a number that declined to a drastically low population of no more than 6000 in the 1970’s. The Galapagos Conservancy says that once there were 14 species of Galapagos land-based tortoises; now there are only 11. 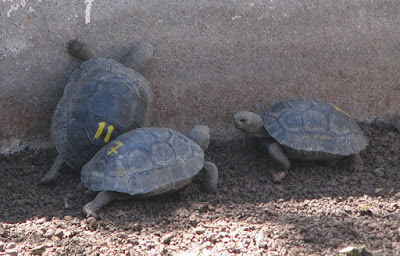 Organizations like the Charles Darwin Research Foundation and Galapagos Conservancy have intervened to help revitalize our land tortoise population. First, through extensive, long-term efforts, harmful animals such as goats and rats have been eradicated, thereby reducing threats to the young tortoise population. Eradication alone was not enough because a way had to be found to increase the population. This has been accomplished through a captive breeding program. In our program, scientists usually take eggs laid in the wild from their nests and remove them to incubate and hatch in a protected environment. In other situations, adults are taken into captivity and encouraged to mate. This second approach is taken when the population is so decimated that the male and female tortoises are unable to find each other because there are so few and they are so spread out over the island’s land mass. In this case, we put the species together and enable them to repopulate. 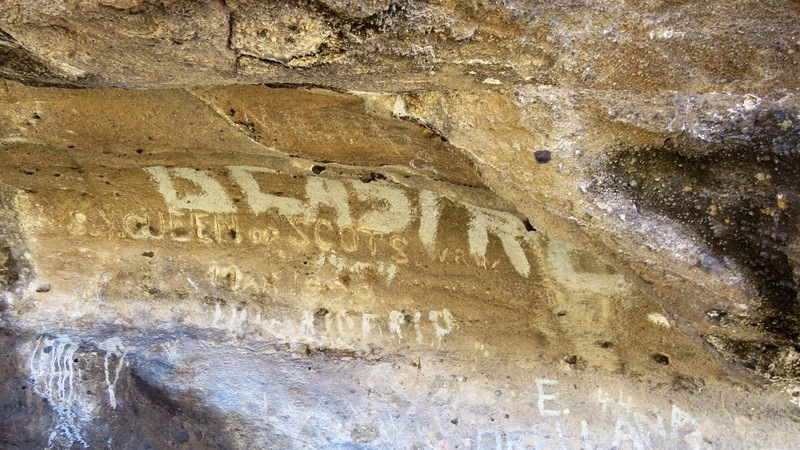 This is what was attempted unsuccessfully with Lonesome George – the last remaining Pinta Island tortoise. 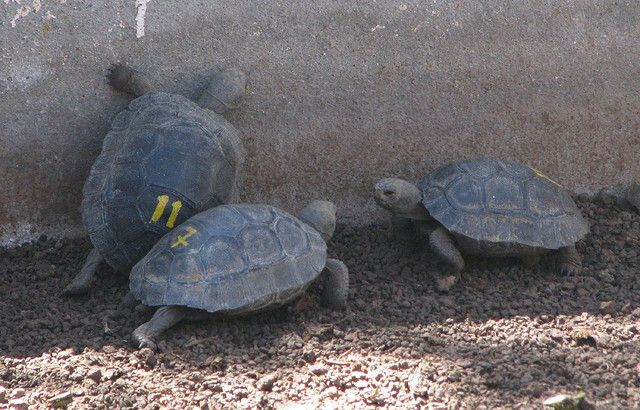 But, the same approach has been successful in the case of Pinzon and Espanola tortoises. In either case, the hatchlings are reared in natural, but protected, habitats, until the age when they can live on their own. Then, they are released back into their natural habitats. The preservation efforts are working and the giant Galapagos tortoise population is growing. 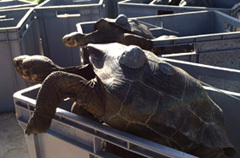 As of 2013, according to the Galapagos Conservancy, at least 550 tortoises have been repatriated to Pinzon Island and another 1700 have been returned to Espanola. 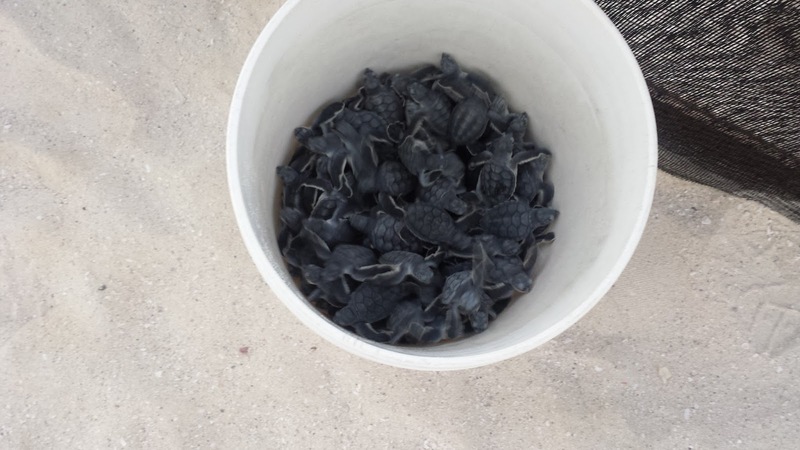 In June 2015, 200 babies were released on Sante Fe Island. To read more about the Galapagos Giant Tortoise Restoration Initiative, go to the Galapagos Conservancy site. http://www.galapagos.org/conservation/tortoise-restoration/ and http://www.galapagos.org/conservation/galapagos-giant-tortoise-webcam-project/. 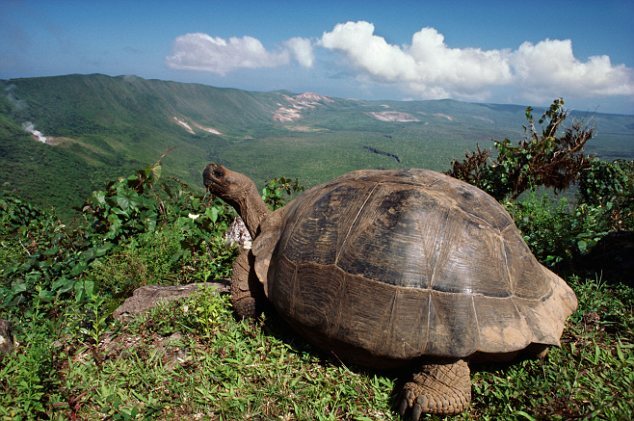 But, Galapagos does not have only endemic giant land tortoises. We also have endemic green sea turtles. Like Galapagos land turtles, Galapagos green sea turtle population density has dwindled considerably, to the point where they are another endangered species. 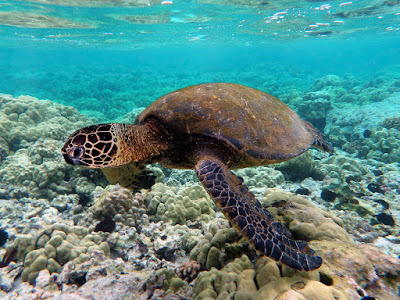 In fact not only the endemic Galapagos subspecies of green sea turtle is endangered, but green sea turtles throughout the world are in trouble. They have been considered on the red list of endangered species under the Endangered Species Act and by the International Union for the Conservation of Nature. Sea turtles mate in the water, then the pregnant female finds her way to a beach where she digs a large nest and deposits as many as two hundred eggs. At first blush, one might think that with two hundred possible offspring, there’s no way that the population could be at risk. But, that conclusion would be wrong. Many obstacles, both made-made and natural, impede the regeneration of the sea turtle population. Consider that the mere fact that an egg is laid does not mean that it will hatch. And those that do become little hatchlings must survive the long trek from the nest to the ocean. The truth is that not many make a successful return to their ocean destination. Many die during their journey as birds and other predators lay in wait to eat the hatchings. Others are too weak to make the walk. On many beaches, you can find people taking a walk along the seashore without a care in the world, not even realizing that they are walking right on top of a nest of turtle eggs. Nature plays funny games with the baby tortoises. Maybe, from an evolutionary perspective, there was a time when there was a balance between the large number of eggs and the number that survived. But, that balance exists no more and the successful birthrate has declined enough to render the entire species endangered. Concern for the green sea turtle population has existed for many decades and steps are being taken throughout the world to help restore the numbers. There’s a big difference though between the way in which we can intervene to help the land-based giant tortoises and what we can do to help the ocean faring green sea turtle. Since sea turtles mate in the water, man cannot intervene at that level. But, we can do something significant to the eggs once they are laid in the sand on our beaches. 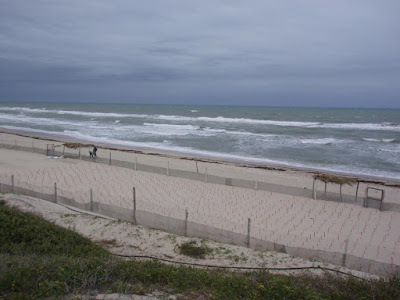 In programs throughout the world, scientists monitor sea turtle nests on the beaches. 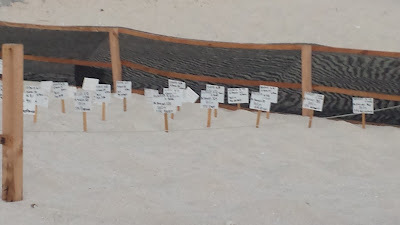 Sea turtles come to shore during the night, build their nests, lay their eggs and leave - they do this under the watchful eyes of conservationists. 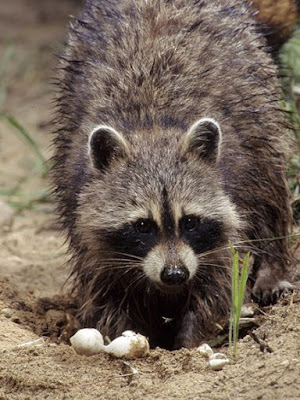 In the morning, scientists go to those nests and carefully dig up the eggs and remove them to a protected, but still natural, environment where the eggs can gestate to fruition for a period of about 60 days. 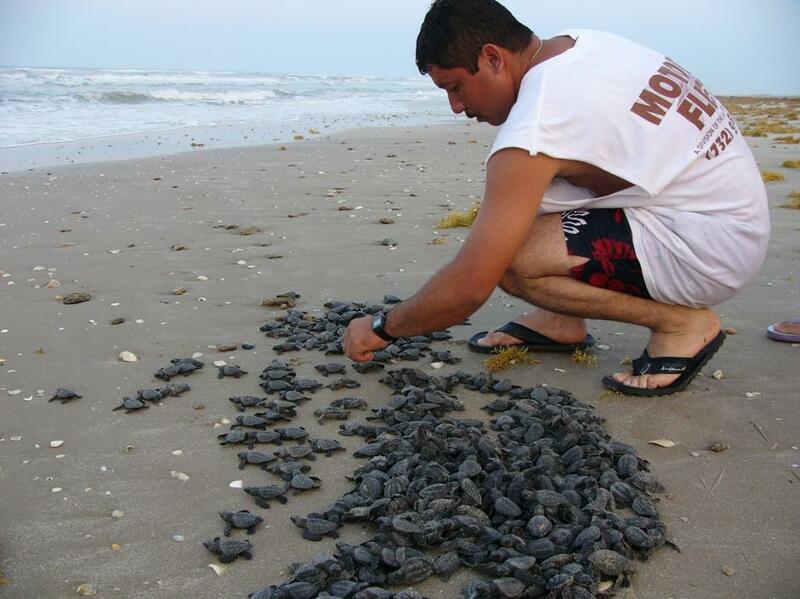 When the hatchlings appear, they are immediately removed from the beach, again to prevent predators from invading. 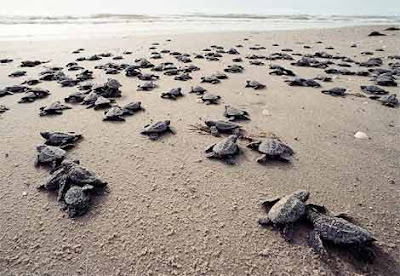 After twenty-four hours, by which time the babies are strong enough to survive in the ocean, they are taken down to the shore and released into the ocean. It is estimated that by this process, about 10% of the hatchlings will survive, 10 times the number that are likely to survive without human help. Because of these programs, the green sea turtle population throughout the world is returning. The National Oceanic and Atmospheric Association and the U.S. Fish and Wildlife Service has proposed to reclassify the green sea turtles in Florida and the Pacific coast of Mexico from endangered to threatened. This provides proof that conservation efforts are making a difference and demonstrates the effectiveness of the Endangered Species Act. Hopefully, some day, sea turtles will no longer be endangered, but thrive worldwide. 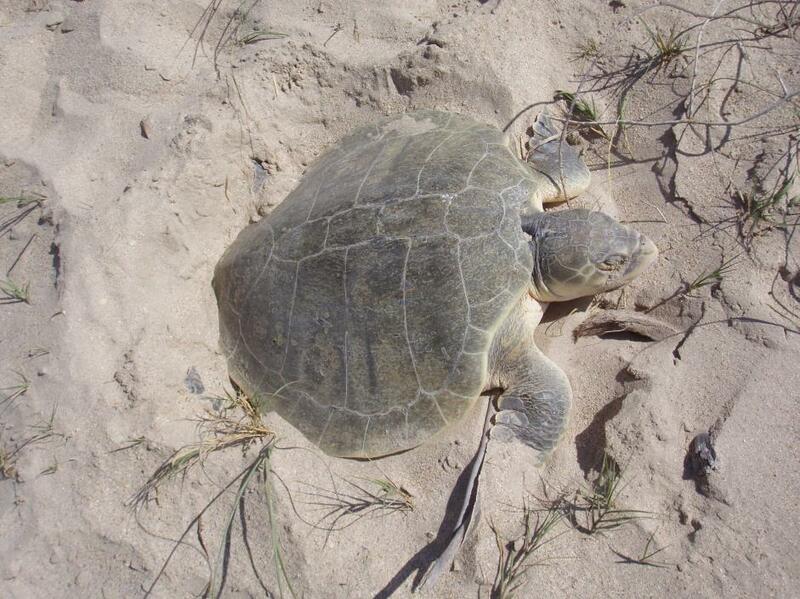 For more information, go to http://www.fisheries.noaa.gov/pr/species/turtles/.